Remember, your ultimate goal is to give away as little as possible in order to close the Deal. Every time you discount your product or service you discount yourself and eat away your profits. This was the last close in one of my previous articles, “In Recession Time, Can We Close A Good Deal“’ now what if you still could not close a good deal, would you think to move to the second approach, putting in mind that your giveaway still should be little to your customer. When it comes to making a deal, people often do and say things that don’t indicate their true feelings or objectives. Thus, part of the art of negotiation is being able to read people in that process. Well, here is what happened , In my last weekend my family decide to go for a picnic with our new neighbors , just to know each other in free life, our neighbors little boy bring with him his puppy dog , when my little boy sow the puppy he was so happy, we spend the day playing and laughing, till the moment we decide to move back to home , my little boy start to Cry, his crying was increased the moment we entered our home , finally we realized why he was so angry and crying, as our neighbors took the puppy dog away from him . So thinking about what happened, do you think now it is an easy way to sell your product through the puppy dog formula? Well, I can say yes you can do, all you have to do is to give your (puppy dog) product to your prospective customer for a day or two to see how they like it, in some cases, and you have to invite them to your place to try it themselves. When you are looking to are trying to sell something, it is important to possess strong negotiation skills. Not everyone is good at negotiating — many are intimidated by “confrontation” or “conflict”, and perceive negotiation to be along those lines. 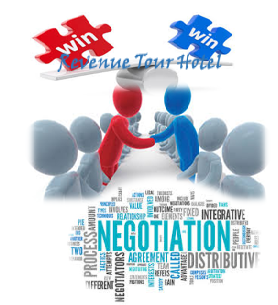 1- Understand your hotel brand / product/service value. Before you try to sell anything, it is critical that you know and understands your hotel brand / product/service value and its inherent value to your customers and prospects. Interview current and previous customers to determine the marketplace viewpoint of your product/service. Your previous customers will give you quite a bit of ammunition for fending off your competitors’ products and services, as they will be able to tell you your weak points and your competitors’ strong points (in their eyes). You have to be open-minded and willing to accept the criticism, and use that criticism to develop stronger value for your product/service line in order to gain the advantage in selling to potential customers. • Some hotel chains have catalogs that enable you to order the bed; the linens; the service trays, glassware, and another decor; even the art from the walls. 2- Know your sales strategy. A sales strategy consists of a plan that positions a company’s brand or product to gain a competitive advantage. Successful strategies help the sales force focus on target market customers and communicate with them in relevant, meaningful ways. Sales team need to know how their products or services can solve customer problems. A successful sales strategy conveys this so that the sales force spends time targeting the correct customers at the right time. How will you sell your products and services effectively? As sales member, you should know your strategy before you begin negotiating. You don’t know how well your customers will have done their homework in advance, so have backup plans for your backup plans. Make sure you put your strategy to paper and put it into action with each opportunity to negotiate a sale. The better and stronger your strategy for selling your products/services, the better positioned you will be to come out ahead when negotiating with a prospect. 3- Study your competitors. Competitor analysis in marketing and strategic management is an assessment of the strengths and weaknesses of current and potential competitors. This analysis provides both an offensive and defensive strategic context to identify opportunities and threats. Profiling coalesces all of the relevant sources of competitor analysis into one framework in the support of efficient and effective strategy formulation, implementation, monitoring, and adjustment and by knowing who your competitors are, and what they are offering, can help you to make your products, services, and marketing stand out. Research and study your competition. Know what they are selling and how it is working for them. Understand their price points and their perceived advantages to your prospect base. Also-know that some of your current customers are likely shopping around. Keeping your competition in your hip pocket will help you continue to develop products and services that provide value to your customers, and will keep you strong at the negotiating table. 4- Understand your Customers and their motivation/ Behavior. Understanding consumer behavior is never simple because customers’ behaviors are changeable. They may not be in touch with their deeper motivations, and they may respond to influences and change their minds at the last minute. All marketers and sales can profit from understanding how and why consumers buy. If you do not understand your customer’s motivations, needs, and preferences you will fall into some major mistakes. The need to predict consumer behavior outcomes is considered to be a very important issue for marketers. Isolated individual psychological constructs such as attitudes, motives, personality traits and learning styles have been used to identify their predictive capacity for actual consumer behavior with varying degrees of success, you need to know your niche market so well that you understand a buyer’s motivation before they come to you. Each customer will be different in what motivates them to buy-but based on past experience in selling your hotel or service, you will have a general idea of their motivation. Ask key questions to further draw that out, and make sure you pay close attention to how they answer your questions. Their answers will always determine your next steps in the negotiation process. 5- Don’t negotiate price-talk value. Some of the sales team may bring up price right away while they start the sales process but and as a matter of fact you need to talk value. Make sure you point out the value of your services/products without mentioning price, especially if you are a price leader. It is very important that the customer understands the value of your products/services if you intend to negotiate to the point of sale. 1- Research – Don’t enter into negotiations blindly. Prepare yourself by spending plenty of time doing relevant research. 2- Improve Your Communication Skills – You simply can’t be effective if you don’t express yourself clearly. Negotiation is a dialogue, and the ultimate goal is for both parties in the discussion to come away with a clear understanding of the terms of the agreement. 3- Be Calm and Confident – During negotiations, you need to keep your cool. Your ability to stay calm and collected (even if it’s only on the outside) works to your advantage. It sends a message to the bargainer that you know your points are strong and valid and that you are determined to reach your goals. 5- Give Something Away – Every negotiator has to make some sacrifices and give something away in order to reach an effective compromise. The best negotiators realize that being tough throughout the whole negotiation can land both parties in a stalemate.